There have been times in the last few months when it seemed Paul Pogba and Jose Mourinho were on a collision course. Their relationship has attracted unparalleled scrutiny since the Frenchman was dropped last season. And while Mourinho has repeatedly dismissed talk of a rift between them, last week he insisted he was "completely in the dark" over his future. The soap opera is sure to rumble on, but when he plays as well as he did in their 3-0 win over Young Boys, it is tempting to wonder why Manchester United are not doing everything in their power to tie him to the club for the long term. This was Pogba at his dominant best. His match-winning performance ensured United's European campaign began in style. His first goal was the highlight. It had been a difficult opening for United on the artificial pitch in Bern, with Young Boys looking menacing on the break, but everything changed when Pogba decided to take matters into his own hands, latching onto a loose ball on the edge of the opposition box and scooping an ingenious, left-footed finish into the top corner. It was a moment of brilliance and it wasn't long before he had doubled the advantage. Kevin Mbabu was harshly penalised for handling Luke Shaw's cross, and Pogba made no mistake from the spot, sending it high into the net after a stuttering run-up. Afterwards, Mourinho praised his "personality" in stepping up so soon after his miss against Burnley. 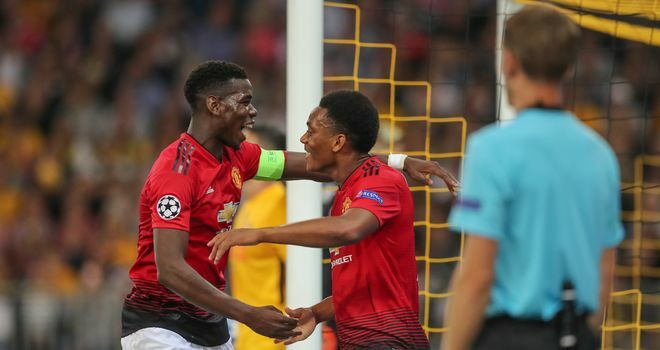 Pogba turned creator for United's third, carrying the ball forward on the counter-attack before sliding his pass through to his countryman Anthony Martial, whose deflected finish wrong-footed Young Boys goalkeeper David von Ballmoos. Pogba had earned a rest. He made way to the sound of applause from the travelling fans in the 75th minute. The goals and the assist were the headline statistics but Mourinho will take just as much satisfaction from Pogba's all-round performance. At the time of his withdrawal, he had had more touches and made more passes than any other player on the pitch. His total of 50 completed passes out of 54 included some eye-catching flicks and impressive switches of play. "He kept possession, he gave the team the pace we sometimes needed, and he controlled the tempo," said Mourinho afterwards. Mourinho has been critical of Pogba's defensive performances in the past, but it was notable that he also praised his "solidity" on Wednesday night. Pogba provided urgency and penetration in possession but he also worked hard out of it, regaining possession more times than anyone else on the pitch (11) despite sitting out the final 15 minutes. It all added up to an excellent night's work both for Pogba and for United. Mourinho's side were teetering on the brink of crisis after consecutive defeats against Brighton and Tottenham last month, but thanks to Pogba they have now responded with three victories on the bounce. Momentum is with them again and it seems to be with Pogba, too. The 25-year-old struggled in the defeat to Brighton and failed to make his presence felt in the 3-0 reverse at home to Tottenham, but he is beginning to look more like the player who was so important to France's World Cup success during the summer. As always with Pogba, however, the challenge now is to keep it up. 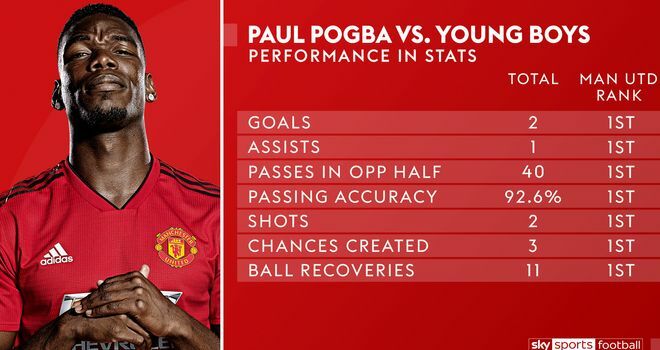 His time at Old Trafford has been a story of ups and downs and infuriating inconsistency, but his performance against Young Boys was a reminder of just how good he can be. Manchester United will need more of the same from their main man in the weeks and months ahead.